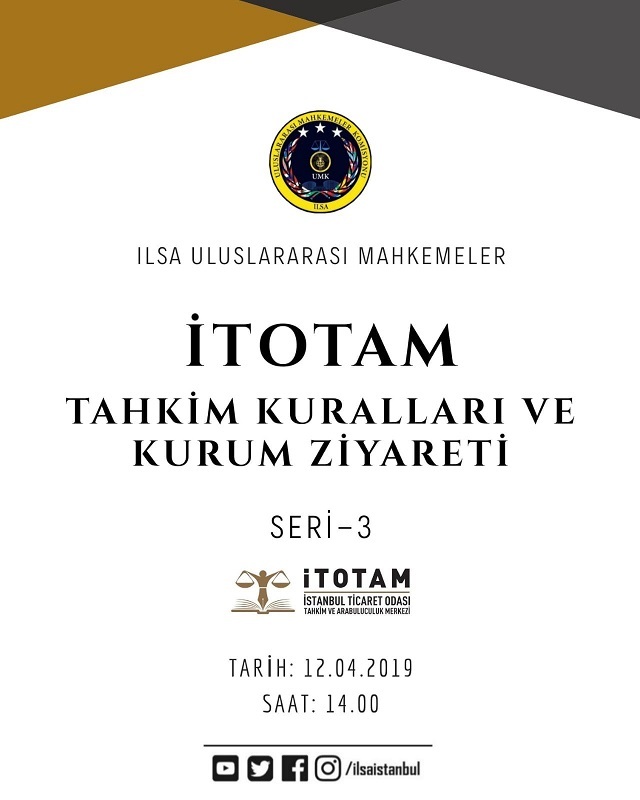 Istanbul Chamber of Commerce Arbitration and Mediation Centre (ITOTAM) is happy to be hosting the second ‘Compulsory Mediation in Commercial Disputes and ITOTAM Conference’ on April 17, 2019. Secretary General of ITOTAM Av. Senem Bahcekapılı Vincenzi will inform the participants about the arbitration and mediation services of ITOTAM. A meeting will be held with the law students from the International Law Students Association (ILSA) on April 12, 2019. During the meeting, Secretary General of ITOTAM Av. Senem Bahcekapılı Vincenzi will inform the participants about the arbitration and mediation services of ITOTAM. One Day at ITOTAM Project has started. 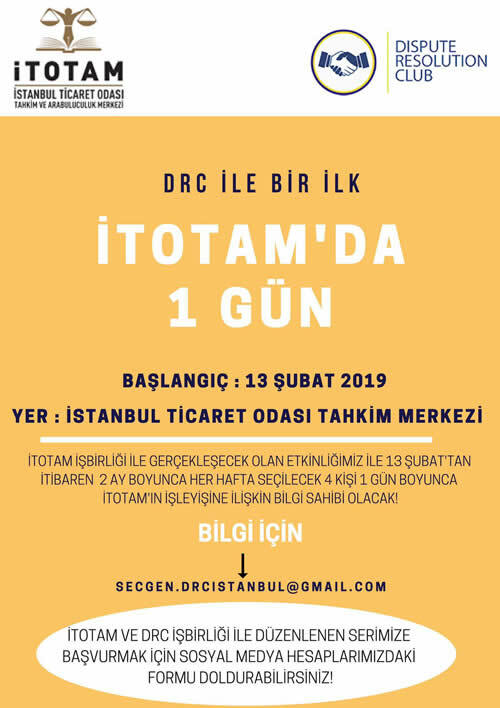 With the ‘One Day at ITOTAM Project’ which is carried out in collaboration with the Istanbul University’s Dispute Resolution Club (DRC), every week for 2 months, 4 students from the Law Faculty of the Istanbul University will spend the whole day at ITOTAM. 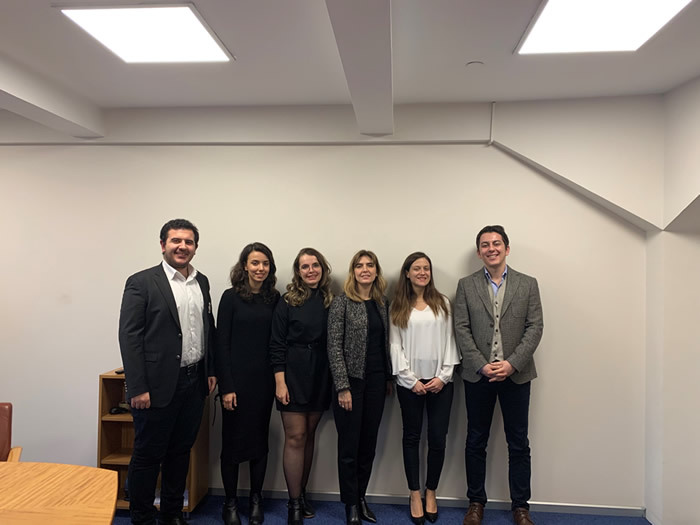 We started with the first group on February 13th, 2019 and discussed issues related to arbitration and mediation in Turkey and in ITOTAM. Mrs. Senem Bahçekapılı Vincenzi, Secretary General of ITOTAM participated to the official launch of the Prague Rules on the Efficient Conduct of Proceedings in International Arbitration. The new «civil-law» set of rules for taking evidence in international arbitration was officially signed 14th of Deceber 2018 in Prague after 10 years of its drafting. The opening ceremony organized by Russian Arbitration Association (RAA),Global Arbitration Review (GAR) and The Law Offices of Prof. Dr. Alexander Bělohlávekwas held in a privately owned historical location Martinický palác (Martinic Palace) in the Prague’s old city. 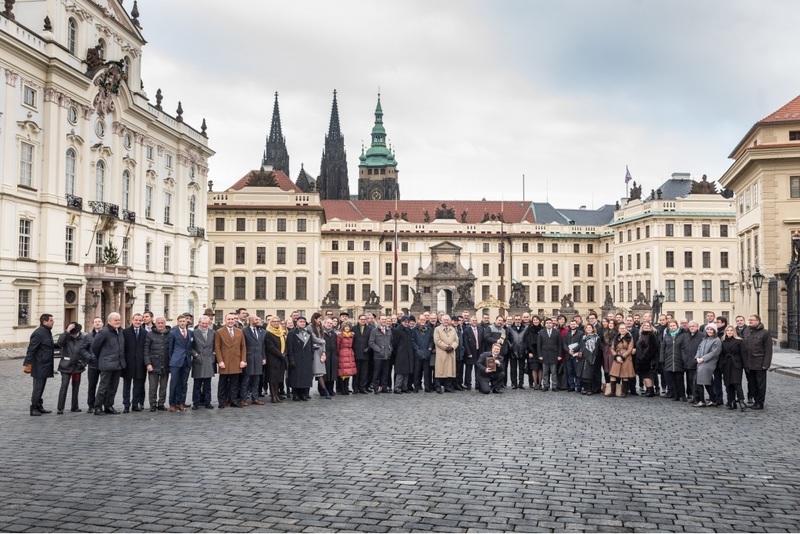 The conference dedicated to the Prague Rules gathered more than 150 arbitration practitioners, experts, and in-house lawyers from world’s top companies and was followed by the official signing ceremony of the Prague Rules signatory book, which will be deposited in Prague. Mrs. Senem Bahçekapılı Vincenzi, Secretary General of ITOTAM participated as Turkish delegation the thirty-sixth session of Working Group III working in the field of Investor- State Dispute Settlement Reform. Mrs. Senem Bahçekapıl Vincenzi, Secretary General of ITOTAM attended to the IFCAI General Assembly which took in Rome on Monday, October 8, 2018. Draft Prague Rules are published. Please click here to view the Draft Prague Rules Inquisitorial Rules on the Taking of Evidence in International Arbitration (The Prague Rules). Our Article on Turkish Domestic and International Arbitration Law has been published in Russian Arbitration Association’s 2017-2018 Annual Report. Please click here to view ITOTAM Secretary General Av. Senem Bahçekapılı Vincenzi and Av. Buse Niseoğlu’s Article. European Arbitration Chamber delegation visited our institution on April 3, 2018. During the visit, the current issues in Turkish Arbitration Law and practices of ITOTAM have been discussed. On March 23, 2018, the seventh meeting of ISPRAMED took place at Milano with participations of ITOTAM Secretary General Av. Senem Bahçekapılı Vincenzi and Istanbul Chamber of Commerce Legal Counsel Prof. Dr. Ergun Özsunay representing ITOTAM, Stefano Azzali representing Milan Chamber of Arbitration (CAM), Dr. İsmail Selim representing Cairo Regional Centre for International Commercial Arbitration (CRCICA), Salah Dhibi representing Tunis Arbitration Centre, Hicham Zegrary representing Casablanca Arbitration and Mediation Centre (CIMAC), ISPRAMED Network Coordinator Charless Jarosson, ISPRAMED Network Advisor Valentina Renna and Lorena Martignoni representing ISPRAMED. During the meeting, the subject of ‘Timing in Arbitration’ and related issues were discussed. ITOTAM entered into new cooperation agreement with Russian Arbitration Association (RAA). The institutions signed a cooperation agreement on 17 November 2017. This cooperation will provide convenience in respect of commercial relationships between Russian and Turkish companies and promote arbitration as an alternative dispute resolution mechanism in both countries. Istanbul Chamber of Commerce Arbitration Centre (ITOTAM) will be hosting ITOTAM Istanbul Arbitration Days Contemporary Topics in and Future of Arbitration on 17 November 2017. The conference will take place at the İstanbul Chamber of Commerce headquarters. We are proud to announce that our arbitration centre became a member of IFCAI (International Federation of Commercial Arbitration Institutions). The membership will enable us to receive more international recognition and cooperate with other arbitration centres in a wider sense. In the previous years ITOTAM has established cooperation with the Institute for the Promotion of Arbitration and Mediation in the Mediterranean (ISPRAMED), the Chamber of Arbitration of Milan (Camera Arbitrale Milano), Pakistan National Centre for Dispute Resolution (NCDR). Recently, we have also established cooperation with Iran Arbitration Centre (ACIC). This cooperation will provide convenience in respect of commercial relationships between Iranian and Turkish businessmen and enterprises and promote arbitration as an alternative dispute resolution mechanism in both countries. Our Kluwer membership is renewed. Researchers who are interested in arbitration law are most welcome to gain free access to Kluwer Arbitration’s database. For further information, please contact ITOTAM Secretariat. For Kluwer Arbitration web site, please click here. As part of the ELSA Istanbul Lawyers at Work Organisation, ITOTAM Secretary General Av. Senem Bahçekapılı Vincenzi explained ITOTAM Arbitration Rules along with her experiences in the field at Istanbul Chamber of Commerce on December 15, 2016. ITOTAM Secretary General Av. Senem Bahçekapılı Vincenzi explained ITOTAM Arbitration Rules along with her experiences in the field at Yeditepe University on October 12, 2016. List of Newly Arrived Books. On July 11 2016, the sixth Meeting of the Network of the Mediterranean Arbitration Centres took place through conference call. Please be informed that the first two Reports shared by the Centres namely; "Report on the Criteria for Selection of Arbitrators" and "Report on Independence and Impartiality of Arbitrators" have been published on three reputed arbitration Reviews as; Revue de l’Arbitrage, the Journal of Arab Arbitration and Rivista dell’Arbitrato. İTOTAM starts to organize "Istanbul Arbitration Days Conferences". Istanbul Arbitration Days 2016 (1)- Recent Developments in Arbitration" conference will be held on 3 June 2016 at the Istanbul Chamber of Commerce. ITOTAM Secretary General Mrs. Senem Bahçekapılı Vincenzi will make presentation on "Why ITOTAM Arbitration Rules for Sports Disputes?" for the conference on "Recent Problems on Sports Law" to be held in Yeditepe University Law Faculty on 30 April 2016. Please be informed of the upcoming ICC-FIDIC Conference on International Construction Contracts and Dispute Resolution, taking place in Istanbul on 29-30 March 2016. Members of the ITOTAM Arbitration Court; Prof. Hakan Pekcanıtez (President), Prof. İlhan Helvacı (Vice-President) and Assoc. Prof. Ali Yeşilırmak, will make presentations about ITOTAM Arbitration Rules and other arbitration law issues for the conference organized by the Istanbul Bar Association to be held on 19 March 2016 on "Domestic and International Arbitration Law and Case Studies of Other Jurisdictions". ITOTAM and National Centre for Dispute Resolution (NCDR) as of February 2016 have signed a cooperation agreement on arbitration and mediation to establish cooperation for the purpose of offering Pakistani businesses operating in Turkey, and vice versa, a forum to solve their disputes arising of commercial transactions, by using both institutions arbitration centers. ITOTAM Vice-President Prof. İlhan Helvacı and Secretary General Ms Senem B. Vincenzi participated as Turkish delegation the sixty- fourth session of Working Group II (Arbitration and Conciliation) held in New York on 1-5 February 2016. Subscription to Kluwer Arbitration ! KluwerArbitration.com is the world's leading online resource for international arbitration research. You can have access to the Kluwer Arbitration web site by visiting ITOTAM library in our headquartes. Please contact ITOTAM Secretariat for more information.